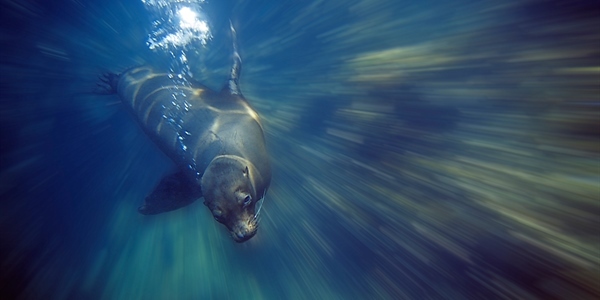 One of the best ways of diving the Galapagos Islands. 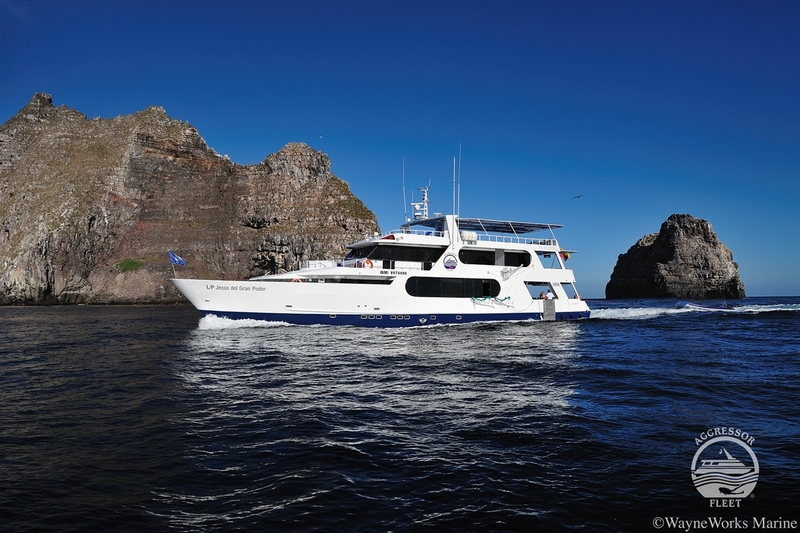 The Galapagos Aggressor was built for spectacular diving journeys around the Galapagos Islands offering some of the most respected and successful diving trips around the islands. Departing every Thursday for 7 night itineraries with the large boat being equipped to the highest standards of comfort available. Just like aboard any other Aggressor boat, the experienced captain, friendly crew, professional naturalists and dive masters will lead you through the trip whilst helping with any questions or queries you may have regarding the diving, meals or the boat. 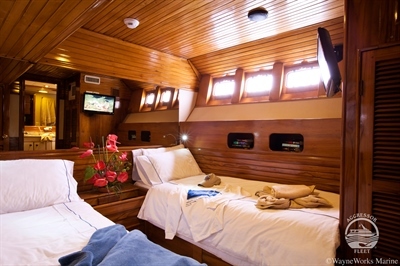 The Galapagos Aggressor has 7 deluxe cabins, 4 with 2 single berths and 3 with a queen bed. All cabins come with en-suites, air conditioning, hair dryers, port window, closet and TV/DVD/MP3. The large lounge and dining area is comfortably furnished with tables and chairs providing enough space for all 14 guests. She has a large sundeck with shaded and un-shaded areas furnished with chaise lounges, deck chairs and hammocks. 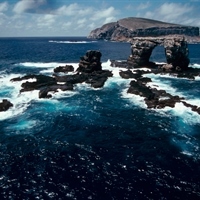 There is also a bar, grill and a hot tub area providing the perfect place for divers to relax after a hard day’s diving. The large dive deck has 2 rinse tanks, dive lockers, 3 tier camera tables and a charging station for keen photographers to take full advantage of. 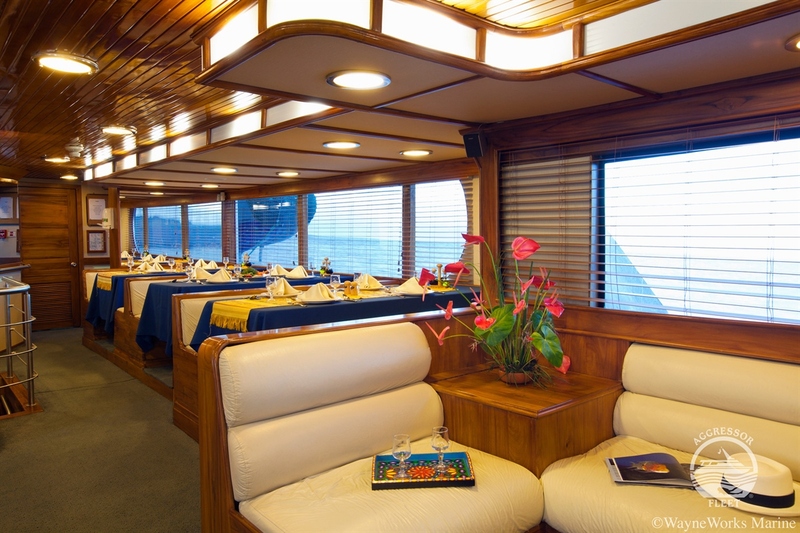 The food onboard the Galapagos Aggressor is a variety of American cuisine, barbeques and local cuisine to suit every guest’s needs with the chef catering to special dietary requirements if known well in advance. The breakfast aboard is made to order and will be a mixture of fresh fruits, hot entrees, cereals and juices with the lunches being served buffet style with a variety of soups, breads, salads, sandwiches and entrees. Dinners are chef prepared consisting of salads, vegetables, seafood, beef or chicken with a special homemade desert every day. Mid-morning and mid-afternoon snacks are provided for guests in between dives and include a selection of beverages such as fruit juices, soft drinks, iced water and tea, coffee and a selection of complimentary local beer and wine. A comfortable stateroom located on the lower deck, each with a port hole, two twin beds side by side and a private head and shower. Your stateroom is the perfect place to read a book, nap in between dives and fully recharge for the next day. 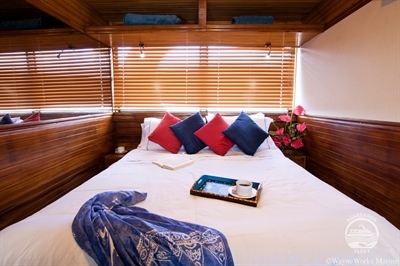 A comfortable stateroom located on the upper deck with a port hole, two twin beds or a queen bed with a private head and shower. Your stateroom is the perfect place to read a book, nap in between dives and fully recharge for the next day. 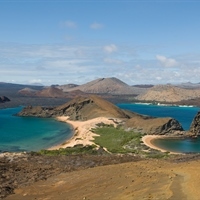 When aboard cruising the Galapagos National Park, you can explore Darwin's living laboratory while enjoying all the creature comforts of this custom-built dive vessel. 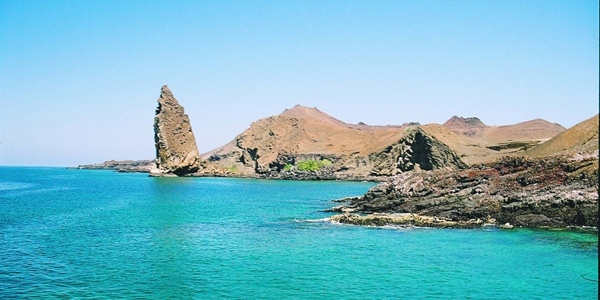 Galapagos is a diving destination on any avid diver’s bucket list as dive sites clustered around the islands offer great diving experiences. 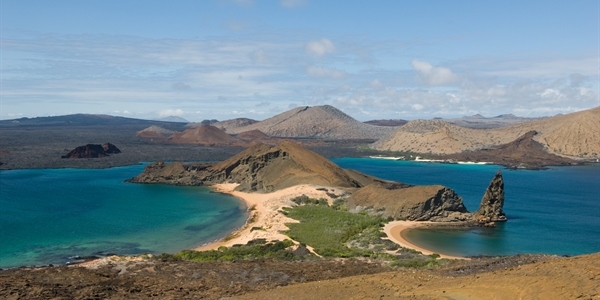 The Galapagos is one of the most exciting destinations in the world. 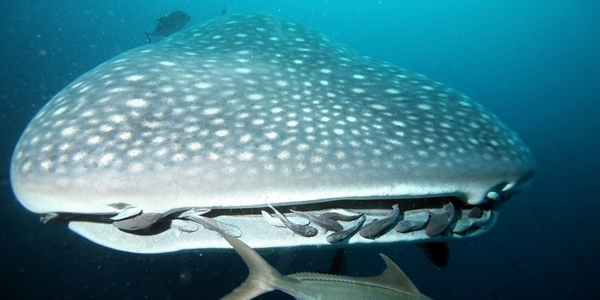 Guests will have the opportunity to dive with playful Sea Lions, travel to the famous Darwin and Wolf for thrilling diving to see Hammerhead Sharks, Whale Sharks, clouds of Tuna and much more. 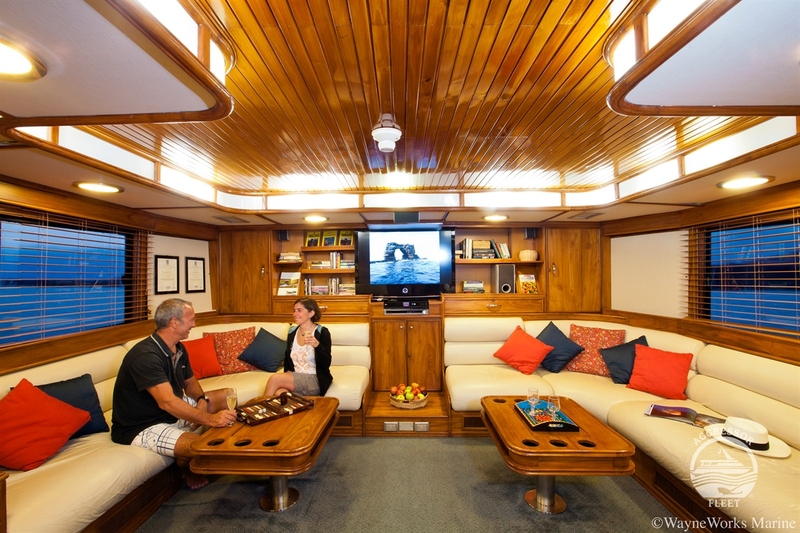 Fully equipped for diving, the boat offers spacious cabins, fine dining and two dive masters on board. There’s plenty of room on deck for all your equipment and prices include all your meals and drinks, including local wines & liquors and up to 4 dives daily with free Nitrox and the services of a naturalist dive instructor and dive master. 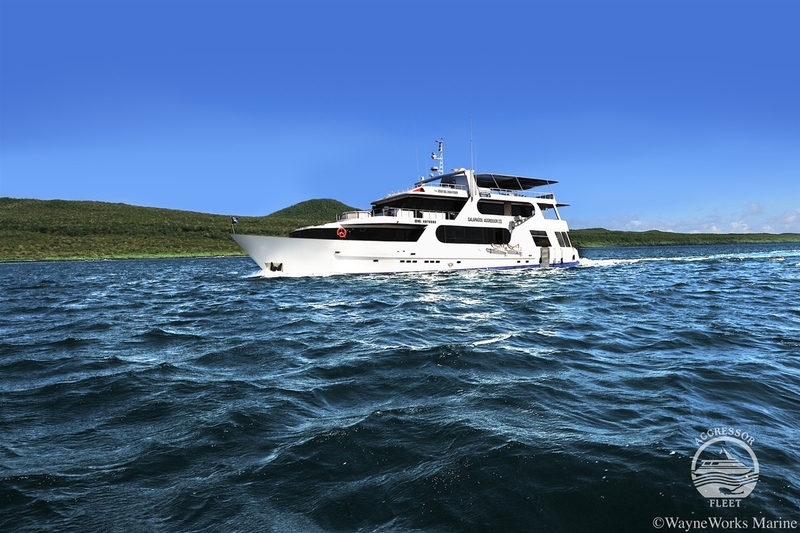 Specially built for diving, the Galapagos Aggressor is a 30 metre luxury motor boat easily accommodating 16 people comfortably. All equipment rental price are for 7 night charters except the dive light which is per night. There are 5 dive sites in Seymour suitable for all levels of divers, although sometimes the currents can be strong. 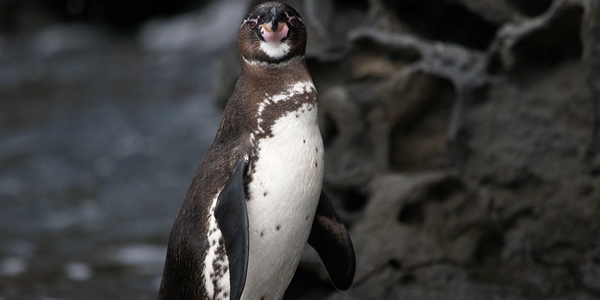 Divers can see cleaning behaviour, a large garden eel colony, sea turtles, sea lions, fur seals, eagle rays, yellow-tailed grunts, big-eyed jack, and frequently white tip reef sharks and hammerheads. 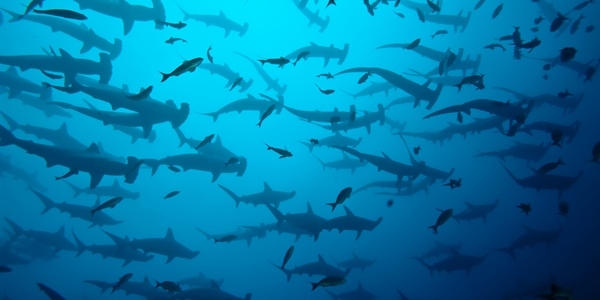 Occasionally, Galapagos sharks can also be seen here. 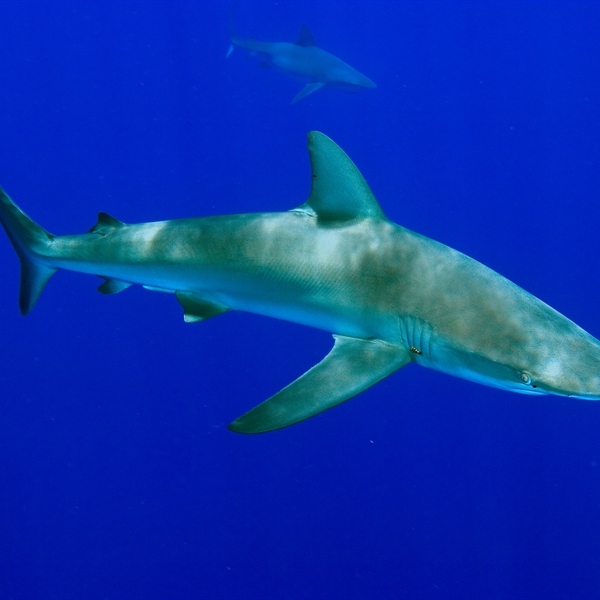 This site offers divers the opportunity to see Hammerhead Sharks, Manta Rays, White Tipped Sharks, Galapagos Sharks, Eagle Rays, Golden Rays, Green Turtles, Sea Lions. North & South Plaza are divided by a channel that is almost man-made in aspect. 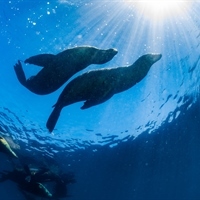 Here, on the rocky bottom divers will have the best time of their life with a very playful school of sea lions.